Chef Bruce Aidells dishes on the tastes and flavors of your favorite foods! 1. Make 4 deep slashes in each lemon. Place into a small covered microwavable container. Microwave for 5 minutes at high heat, or until skins are soft and the lemon juice has come out of the lemons. Pour off the lemon juice and save for later. When lemons are cool enough to handle, scrape away all the pulp and pith from the skin. Coarsely chop the skins. 2. To make the roasted lemon paste: Set up a food processor with a small bowl. With the motor running, drop in the garlic and chop. Add lemon peel and remaining ingredients and chop to form a coarse paste. Separate 2 tablespoons of the paste for the roasted lemon vinaigrette and smear the remaining paste all over the lamb chops. Set these aside while you prepare the vinaigrette. 3. To make the vinaigrette: Combine the reserved lemon paste, 2 tablespoons of reserved roasted lemon juice and parsley. Stir in the oil and set aside. 4. To grill the lamb: Shake or scrape off some of the paste. Season with salt and pepper and place meat directly over a medium-high charcoal or gas fire. Grill about 3 to 4 minutes and turn. Grill 3 to 4 minutes more or until the internal temperature reaches 125 to 130 degrees Fahrenheit for medium-rare. 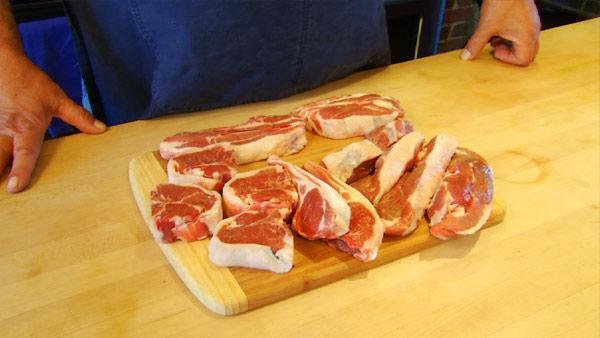 Transfer lamb to a carving board, loosely cover with foil and let rest 5 minutes. Spread a quarter of the roasted lemon vinaigrette over each chop.